As is now the tradition for Hearthstone set reveals, with a few days left until release Blizzard has stopped the daily drip of new cards and turned on the water cannon. This morning senior designer Ben Brode was joined by caster Dan “Frodan” Chou to play four games using decks built mainly from cards coming in the Whispers of the Old Gods expansion. You can see the whole thing above, and artwork for all of the new cards has been uploaded to the official Hearthstone Facebook page. Blizzard has also confirmed players will be able to earn up to 13 free packs by logging in and completing quests.. Easily the highlight of the stream was Frodan playing Yogg-Saron three times. Yogg is one of the expansion's four titular “Old Gods”, each of which is an expensive, many-tentacled minion with a powerful effect. 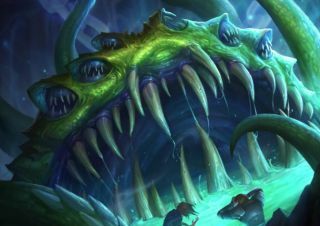 In Yogg’s case, it might just be the craziest RNG card Blizzard has created yet. When you drop Yogg on the board he will cast the same number of spells that you’ve played earlier that game, which will be chosen completely at random, and cast on random targets. That means it’s entirely possible for Yogg to kill your creatures, himself, or even you. Because this is a Battlecry effect, Frodan was actually able to double the number of spells Yogg cast because he already had Brann Bronzebeard on board. As you can see from the video, it’s a gloriously ridiculous card—and the final time he played Yogg it was arguably even funnier. Whispers of the Old Gods launches on Tuesday 26th, but in the meantime can try out some Yogg interactions using this fan-made simulator. The launch will also see a major update to the way Hearthstone is played, with old sets rotating out of the new Standard format, and nerfs to a number of the powerful Classic and Basic cards announced yesterday. You can read analysis of those from our in-house expert, Sottle, here. The UI will also be getting a makeover, and as we learned on stream, so will the heroes’ emotes. In a stunning blow to the art of BM, you will no longer be able to use spam the “sorry” emote after your opponent makes a horrific misplay and/or you top deck the one card you needed for lethal. All the classes have had “sorry” replaced with “wow”, with each hero having a unique piece of accompanying flavorful dialogue. Fear not, though, my salty friends. If my time on ladder has taught me anything, and it probably hasn’t, it’s that we’ll soon learn how best to use these emotes passive-aggressively, which will lead to more “friend” requests. I asked Brode what had prompted the change to the emotes, and he replied: "We were excited about this particular emote because sometimes really awesome stuff happens and having an emote that lets you share in that fun with your opponent seemed pretty cool to us. We replaced 'Sorry' because we felt like it had the least broad use of the current emotes." Sure, though I think Forsen might beg to differ.